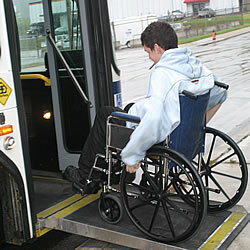 Buses throughout the Kansas City region are fitted with lifts or ramps so the vehicles are accessible to riders with disabilities. It’s just one of many accommodations that the region has in place to ensure equal access to public transportation. Read more about our Mobility Services. The Americans With Disabilities Act requires that all public bus systems provide complementary paratransit service for disabled persons who cannot independently use the bus service because of a disability. Complementary paratransit service is a door-to-door service provided by vans or cabs in KCATA's ADA service area. Generally, the ADA established service area extends three quarters of a mile on each side of regular bus route service. Complementary paratransit service is available on those days and during those times when trips are provided on regular Metro routes. To take advantage of complementary paratransit service, you must be certified as ADA Eligible.